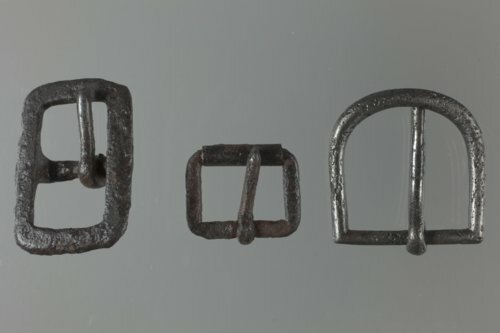 These three buckles were recovered from the Village on the Pawnee Fork (also called Hancock's Village) in Ness County during excavations in 1977. The buckles would have all been used for tack for either horses or mules. The center bar buckle was recovered from the area of all or part of the Oglala camp. The D-shaped buckle was either used on a saddle or the throat latch of a bridle. The roller-bar buckle was recovered from that area of the site that may have had the Cheyenne lodges. In 1867, the village of several hundred Southern Cheyenne and Southern Teton Oglala was destroyed by order of Major General Winifred S. Hancock. The site is listed in the National Register of Historic Places.